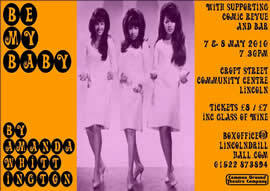 Be My Baby is a short period piece featuring an all-female cast and a nostalgic 1960s sounddtrack. For our small-scale spring / summer production in 2010 we returned to our spiritual home – Croft Street Community Centre in Lincoln – and paired up this touching play with a cabaret-style selection of music and comic turns. Dave Lintin directed the first half of the evening, bringing together many of the women who had made their Common Ground bow in Cider With Rosie. 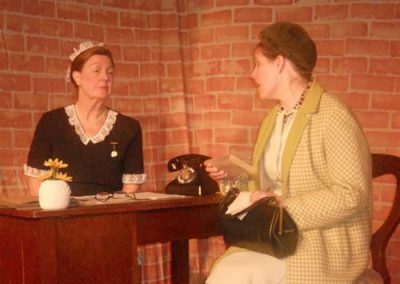 Alex Thornton took the lead role of Mary, the teenager who falls pregnant and has to give her baby up for adoption, while newcomer Val Petty played the matron at the home for unmarried mothers. The second half of the evening featured comic monologues by members past and present, a tribute to Flanders and Swann and a guest appearance by folk singer and musician John Pape. Writing in the Lincolnshire Echo Sheila Jamieson described the show as ‘a sparkling night out’ which was ‘the perfect antidote to the damp weather’.